Wisdom of the Moon: Let the Wild Rumpus Start! 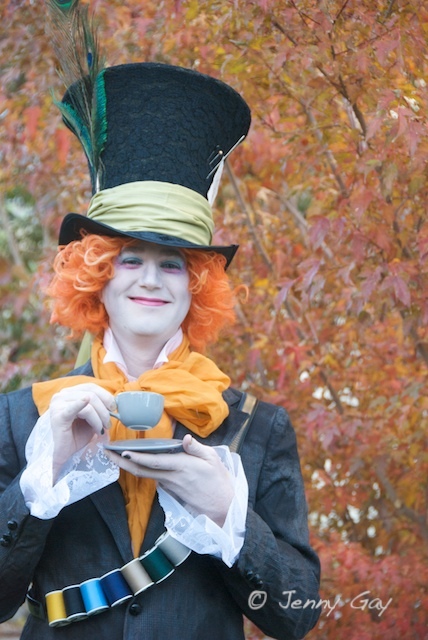 When I found instructions for a Mad Hatter costume on Threadbanger, I immediately decided that someone in our family needed to to make it for Halloween. Our brother Tommy went for it (with some help from his big sisters, of course) and it was fantastic! He was even done with it for a party 2 weeks before Halloween. One Note about their instructions if you want to try this yourself... in the video, they suggest using thick material to stretch over the form for the hat. Don't do it, unless you want to end up with unwieldy wrinkles (something I discovered as I attempted to hot glue the entire thing together for the first time. Grrrr). Use something stretchy instead. 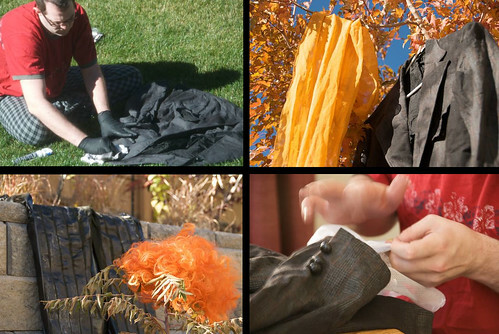 Jenny and Tommy found a gray knit shirt and a black stretch lace shirt at the thrift store to cut up and use. Also, instead of using wire to create the brim, Jenny had the brilliant idea to just form the top part of it right over a black velvet cowboy- or pimp- hat. Amusing that I can't tell the difference between the two. I guess when you're dealing with black velvet, everything takes on nuances of pimp. Since Tommy ended up staying in and watching scary movies on the actual night of Halloween, I got to borrow the costume. 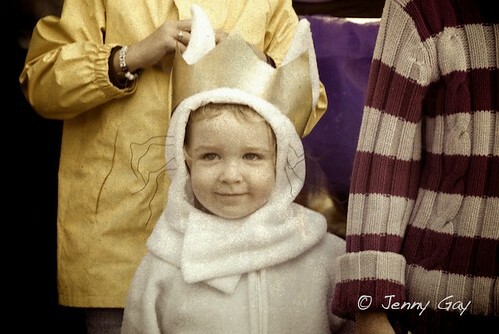 Joey completed the theme as the Cheshire Cat. I am so kicking myself for not thinking to use glow in the dark face paint for her smile. Then she really could have disappeared in the dark just like he did. 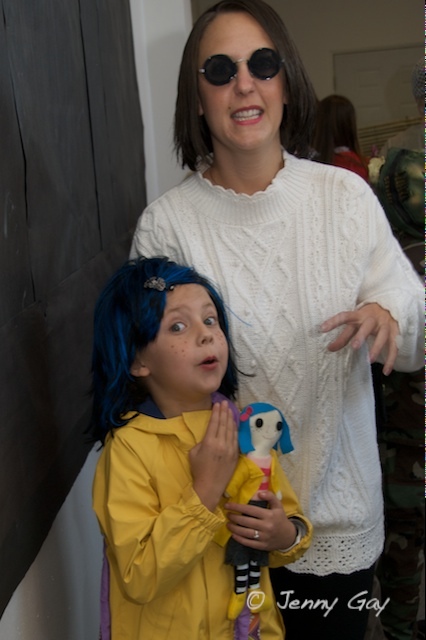 I love Jaden and Aurora as Coraline and the Other Mother. Notice the black nylons stretched over a pair of circular glasses for the button eyes. And Kam was just about the cutest Max that ever there was. His Gram D made his costume using McCall's pattern #5956. 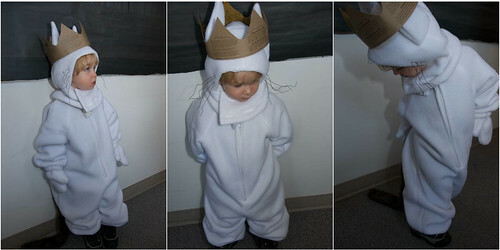 And a cut down, spray painted, inside-out Burger King crown worked perfectly to complete the outfit. Oh, sweet boy, "I'll eat you up, I love you so." What great costumes! And beautiful pictures. I suppose the beautiful weather helped -- lucky you! Those costumes are adorable! 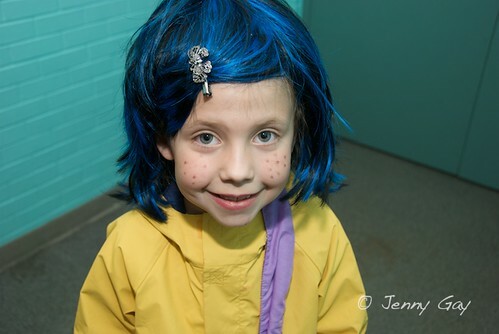 I just about died when I saw the kids dressed up as Coraline and Max. So cute. Hi! 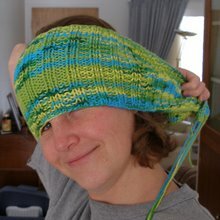 I just found your wonderful blog and wanted to say hello! I will be back for sure! Is that weird that I think Tommy looks handsome on the grass making his costume? Your costumes are ridiculously awesome & make me wish it was close to Halloween again so that I could put all this inspiration to good use. I love all the bookish halloween themes! 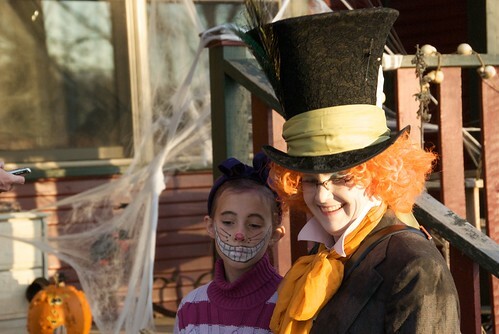 And ANY Neil Gaiman costume is supercool. Awesome! I'm glad you all liked them. I've decided that we need more costume parties, not just at Halloween. You are all so talented and creative. I wish that I lived in Colorado, so that I could get inspired/motivated by you all. When do you have time to do these things? I'm struggling to Lyra dressed in everyday clothes. Wow, you are my heroes! Defne, I would just like to point out that it took 5 adults to produce these costumes. Super heroes, we are not. However, it is a lot more fun to do this sort of thing when you have others to collaborate with. But, yes, you should come back to Colorado so you could share in our Wild Rumpuses.